1. 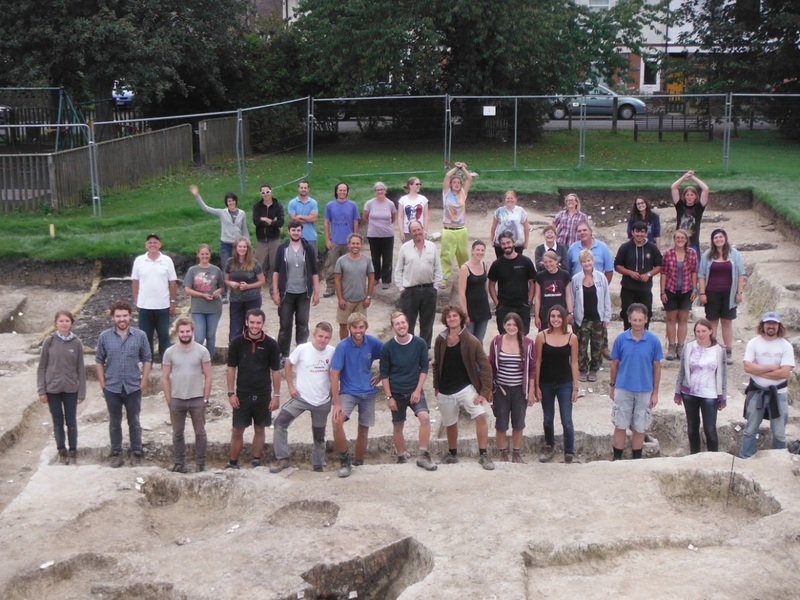 Lyminge Archaeological Project 2014, the grand finale to our three year AHRC-funded project excavating an Anglo-Saxon Royal settlement in south-east Kent, directed by Dr Gabor Thomas. An extremely vivid memory for me is my recollection of walking into a sandwich shop in Spitalfields dressed top to toe like any of the builders and construction workers also in there for their 11am sausage roll and cup of tea, elbowing my way through to grab a sandwich from the cooler. In 2006 I was working on a site not five minutes from Liverpool Street station, in the middle of some of the most exciting urban archaeology in London. It was just me and a (male) supervisor on a relatively small excavation, and it was really my very first experience of acknowledging that I was a woman in a very masculine working world. We were excavating for the foundations of a new office building and had broken the relative monotony of Roman quarry pits with the discovery of several Saxon graves. Up until then, most of my experience had been on training excavations or sites that were in the middle of nowhere with a mixed demographic that didn’t seem to emphasise gender at all, apart from acknowledging basic differences that might affect digging directly, such as overall strength, which didn’t always apply. 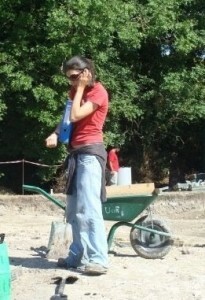 Many female archaeologists I have worked with over the years were quite as capable of shifting just as much dirt in a day as their male colleagues. I am extremely thankful that my very first training dig, the Silchester Town Life Project, introduced me to a working environment based around equality and equal expectations for all genders, ages and abilities/disabilities. Amanda Clarke is pivotal in creating this supportive and encouraging environment at Silchester. In this atmosphere of masculinity in central London, I was actually surprised to find that aside from a few sideways glances, I didn’t receive any of the harassment or teasing that British builders are famous for. Certainly I have no direct recollection of anything like this. I was there to do a job, and it seemed to me very much that they acknowledged that we were all there to work. I have since understood that my experience is anomalous, but what I did know was that should anything have occurred, my male colleague would have ‘had my back’, something I experienced many times on digs. Archaeology, from my experiences in the commercial field, can be incredibly equalising, often because of the need just to get the job done in time and on budget – everyone is relied upon to do an equal share of the work. Any shirkers, male or female, were grumbled about quietly in the pub after work. What I did feel, however, and often still feel, was a need to prove myself just as up to the task as others. I know that if this had been an all-female working environment, I would have worked hard, but not felt the additional pressure to prove I was just as good as the men. The surprising things for me came later on, discovering that many people do experience marked gender discrimination in archaeology and many other disciplines, and that many people actually expect to be treated differently because of their gender. 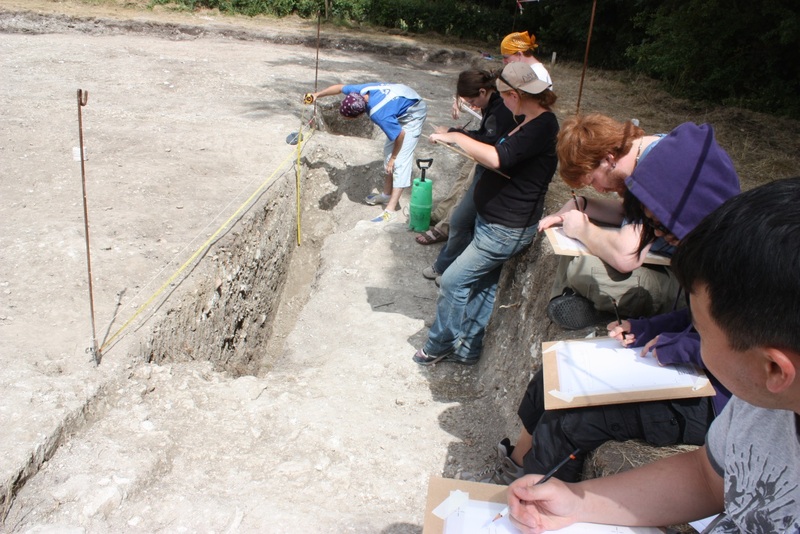 Since my earliest experiences in commercial archaeology, I have gone back to academia, and am currently in charge of the day-to-day running of an excavation that trains both students and local volunteers. The Lyminge Archaeological Project is deeply imbedded in the local community, but also provides many university students with their first or second experiences of excavation in the UK. Despite running the excavation with equal expectations for men and women, with the aims not to discriminate and of encouraging everyone to take part in all the different jobs on-site, we often still see people falling into supposedly gendered roles. Many of our female volunteers spent a day or two digging initially and have since decided that working with finds (sometimes referred to as the ‘housework’ of archaeology) is much more their cup of tea, a choice that is also completely valid. When we ask for volunteers to dig a big ditch slot or pit section, we mostly get male volunteers, despite encouraging everyone to have a go. Gender equality in opportunity must allow for the fact that many people will be quite happy to choose an activity or role that appears to be highly gendered. 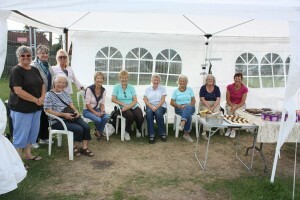 We could not run our dig at Lyminge nearly so successfully without our dedicated team of self-named ‘Lyminge Scrubbers’, and in fact we have been told many times that on our dig they feel really useful and engaged in both the project and the local community. 3. Some of our most dedicated finds processors on our last Friday of the dig in 2013, commonly known as ‘Cake Friday’ as you can see from the groaning tables! It is surprising how many times I have discussed with a female student what I expect them to do and have had them protest that they aren’t able or will be slower because they are ‘a girl’. Contrarily, it also surprises me how annoyed some of our male students are at seeing a female archaeologist out-perform them (I must emphasise that this indignation is rare, but has happened). Having grown up with confident and out-going sisters, an inspiring working mother and an extremely supportive father who worked in archaeology and museums, and having gone to an all girl’s school for the majority of my secondary schooling, it never occurred to me that I could not or should not do something because I am female, or that my hard work might threaten others’ gender identity. I think as a result, many of my students over the years probably remember my disdain of comments like these, particularly in combination with my partner in crime at Lyminge, excavation and training manager Rosie Cummings. At Lyminge, you just don’t get to cry off a task or get assigned a task because of your gender – Rosie never misses the opportunity to point out that her record is 10 post holes fully excavated and recorded in one day whilst 8 months pregnant! Indeed, Rosie has been pregnant twice while working at Lyminge, and for me provides the ultimate role model as a female archaeologist who is completely focused on her job and career, has never let anything get in her way and has been able to organise her working life around her family life always to her advantage. 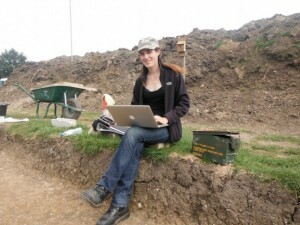 She talks very positively of the support she received from the department at Reading, enabling her to work during the latter stages of her pregnancies – although I must of course point out that Rosie was well used to heavy archaeological fieldwork prior to becoming pregnant, so it was quite safe for her to undertake some excavation work. 4. 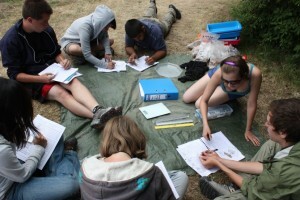 Rosie (in the black jumper and cap) teaches our students section drawing at Lyminge in 2009, two months before giving birth to Archie. 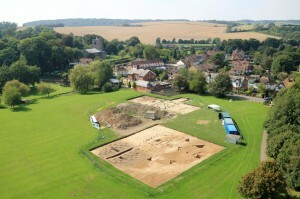 Our primary aim at Lyminge is to excavate a fantastic Anglo-Saxon site whilst providing training for students and volunteers of all abilities, genders and ages, but I am certain that many come away with a better understanding of their abilities and with their preconceptions about gender challenged. I had a great sense of achievement when a male colleague informed me, after my having mentioned something about sexism, that he didn’t see me as a woman but primarily as a colleague and friend, and I hope that many of those who come to Lyminge take away at the very least the understanding that both men and women can successfully run an excavation without discrimination, and with a new confidence in their abilities as a person rather than as a gendered individual. 5. 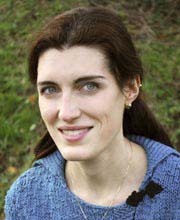 Gemma Watson, current Post-Doc in the archaeology department and one of our Lyminge Finds Supervisors from 2008-2010, teaching finds recording in LYM09. I have been lucky thus far in my career, and I know my generally positive experience does not speak for every female archaeologist. I am well aware that I speak from a position of privilege, as a white, middle class, educated cisgender female who is unafraid to challenge sexism when I see it. 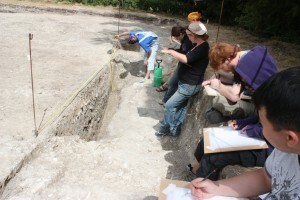 Sexist attitudes or gender-related issues I have experienced have primarily been when working outside of archaeology, and surprisingly have tended to come from other women, (incidentally, something that women collectively really need to work on). While working in archaeology I have been extremely lucky to have had fantastic female role models all the way through my university experience and in the world of work. Male supervisors and employers have too only been encouraging, judging my ability rather than my gender. Never once has it been expressed to me that I might achieve less because of my gender, although it has become clear that women often have to work harder to achieve the same as men. Any difficulties I myself have encountered over my career so far seem less about working in archaeology but rather in academia overall. As a woman, there are many issues I face that my male colleagues will not in such an obvious way. Should I want a family, how will that affect my academic career that is thus far based on short-term contracts for post-doctoral positions? How do I even know when I am being discriminated against because of my gender? I can perfectly understand why many women in science choose a less obvious path to that of their male counterparts as their careers progress. I hope I will continue to aim high and not let my gender dictate my career path, but enhance it. In doing so, the benefit is passed on to men too, where the inequalities or difficulties that they face are much less debated and understood. Empowering women in academia and ‘in the field’ benefits everyone and I am happy to be part of a department that is working hard on doing this. 7. 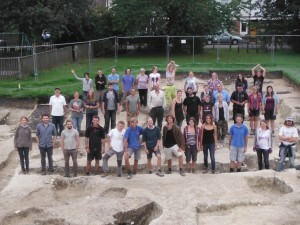 End of dig photo at Lyminge 2014 – all ages, genders and abilities! I am currently the Post-Doctoral Research Assistant on the Lyminge Archaeological project, a 3-year AHRC funded project that is excavating the Anglo-Saxon origins and remains of the monastic settlement in the village of Lyminge, Kent. I completed my PhD at the University of Reading, examining the expression of worldviews and belief systems within Anglo-Saxon settlements during the conversion period. My research focuses on the expression of beliefs in supposedly ordinary activity evident through the archaeological record, which I attempt to access through comparing associated burial evidence and developing theoretical approaches to investigating ritual action. I undertook my BA in Archaeology at the University of Reading and my MA is in European Historical Archaeology from the University of Sheffield.